Nerd Block is offering a special C2E2 themed box this month. They have partnered with Super 7 for an exclusive item, and have revealed it for fans to check out. In the box, buyers will find exclusive variant color Street Fighter M.U.S.C.L.E. 3-Packs. The photo showcases a light blue set featuring Sagat, Blanka and Guile. Different figures and/or colors may show up in the boxes. The Chicago Comic & Entertainment Expo is a comic book and pop culture convention spanning the latest and greatest from the world of comics, movies, television, toys, anime, manga and videogames. This year, attendees will be treated to appearances by Evanna Lynch, Stan Lee, cast members from Stranger Things & more! 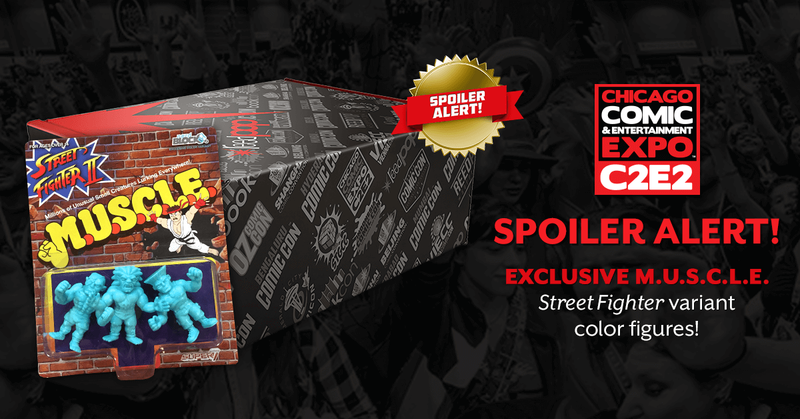 We’ve partnered once again with the fabulous folks at ReedPOP to bring you the C2E2 Limited Edition Block. Each block is filled with 9 C2E2 EXCLUSIVE items! That’s $90 in value for just $39.99! But don’t wait to get yours, quantities are limited so get yours before they’re gone! If you’d like to order the box, you can do so by Clicking Here.